The Razor Blade Co. carries a large range of breakaway blades, scoreless blades and breakaway knives. Breakaway blades are blades that have several score lines that allow the piece to snap off easily once the tip has become dull. These blades come in two standard sizes. The 9mm breakaway blade like our 01-331 is the smaller blade and has 13 points which is perfect for precision cutting, and the 18mm breakaway blade like our 01-771 blade with 8 snap-off points, ideal for heavier cutting. These snap off blades are well suited for de-burring plastic, laying flooring, trimming wallpaper, films, and so much more. We also carry item 01-776 scoreless blades that are great for when you just need a long blade that can cut deeper that normal. The breakaway knives come in both an inexpensive plastic handles and quality metal handles for repetitive uses. The simple and plain plastic handles like the 66-0455 are usually used for uncomplicated jobs where the blades will only be replaced once or twice. The 8 pt. 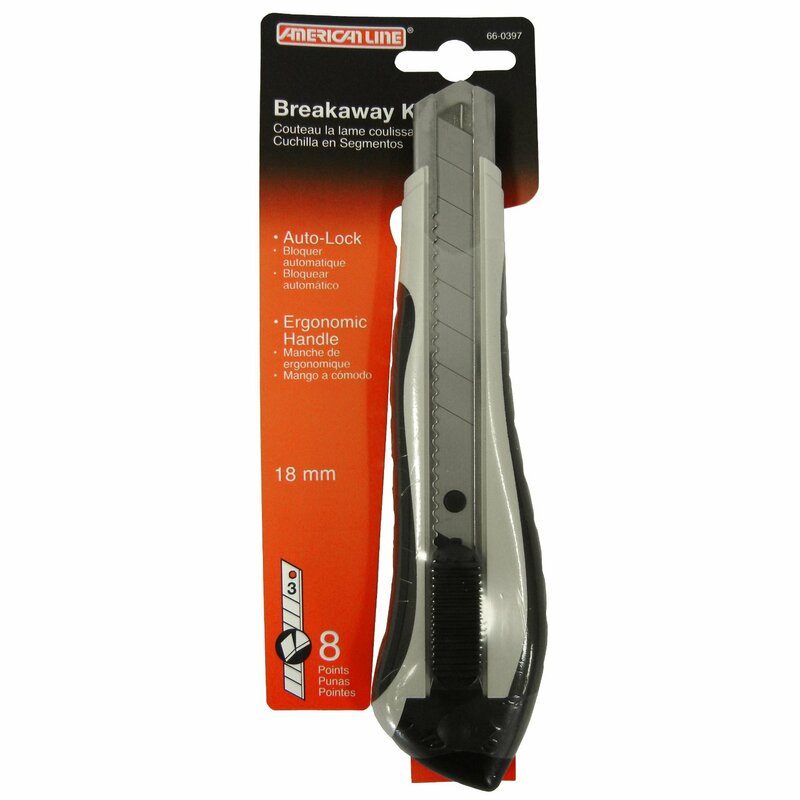 breakaway knife 66-0456 has metal track which gives the breakaway knife a longer life and more stability. These blades are individually wrapped and are featured in bright neon colors, perfect for retail. Our highest quality snap off knife 66-0397 is made completely of metal that offers sturdiness and long life. Breakaway blades and breakaway knives are ideal for rapid and accurate cutting. They have a higher durability, especially for abrasives materials. Using breakaway blades allow you to have less overall blade changes saving you time and ensuring greater working efficiency.